UiPath, the leading enterprise Robotic Process Automation (RPA) Platform, announced today that it has been named an RPA Technology Leader and Star Performer in the RPA – Technology Vendor Landscape, according to Everest Group’s 2018 PEAK Matrix™ assessment. These distinctions make UiPath the only RPA provider to earn both accolades in two consecutive years. Having achieved the industry’s highest rate of customer adoption in 2017, UiPath is now the most widely used Enterprise RPA platform, helping enterprises across geographies and industries accelerate core operational processes to deliver enhanced customer experiences, free employees up to focus on more strategic work and ultimately improve profitability. 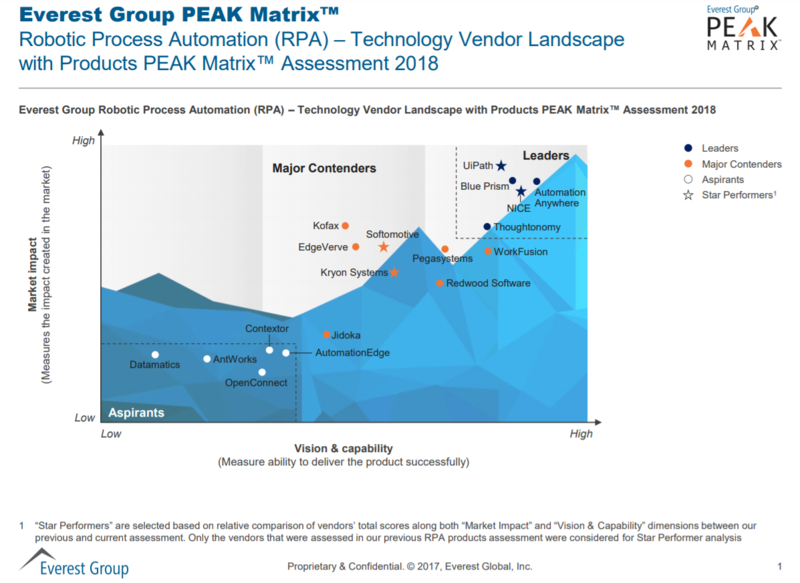 Everest Group’s Robotic Process Automation (RPA) PEAK Matrix™ is a yearly industry assessment providing analysis and insights on RPA vendors and products to assist enterprises in their selection processes. The findings, which are based on an evaluation of vendors’ impact on the market, overarching vision and product capabilities and support, are seen as benchmarks in standards and quality for the RPA industry. As part of the evaluations, vendors are classified into Leaders, Major Contenders and Aspirants, based on key dimensions. The evaluations also denote Star Performers, based on the greatest positive relative year-on-year movement in Everest Group’s assessment. UiPath has seen explosive growth in the past year as its enterprise customer base grew from fewer than 100 customers to more than 700 in 2017, resulting in 8x growth in annual recurring revenue. The company’s global operations now span across 14 countries and employ more than 625 professionals. Be one of the first who reads the report. Pre-register here and we'll send you the Robotic Process Automation (RPA) PEAK Matrix™ as soon as it becomes available.